Integration with OneLogin gives customers the ability to process, analyze and visualize user activity in real-time and historically. Leverage data to make informed decisions about application adoption to accelerate return from your cloud investments. OneLogin brings speed and integrity to the modern enterprise with an award-winning single sign-on (SSO) and cloud identity and access (IAM) management platform. Their portfolio of solutions secures connections across all users, all devices, and every application, helping enterprises drive new levels of business integrity, operational velocity, and team efficiency across all their cloud and on-premise applications. The choice for innovators of all sizes, OneLogin manages and secures millions of identities around the globe. 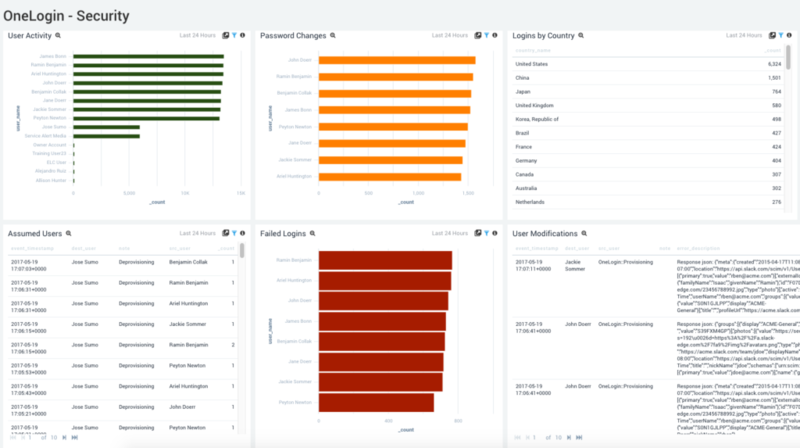 Sumo Logic’s cloud-native log analysis app allows you to audit user activity from OneLogin, which means you have readily-available, comprehensive information trails to draw on in case of an investigation. It also allows you to search for specific events or types of activity. See how users access resources and applications via OneLogin. 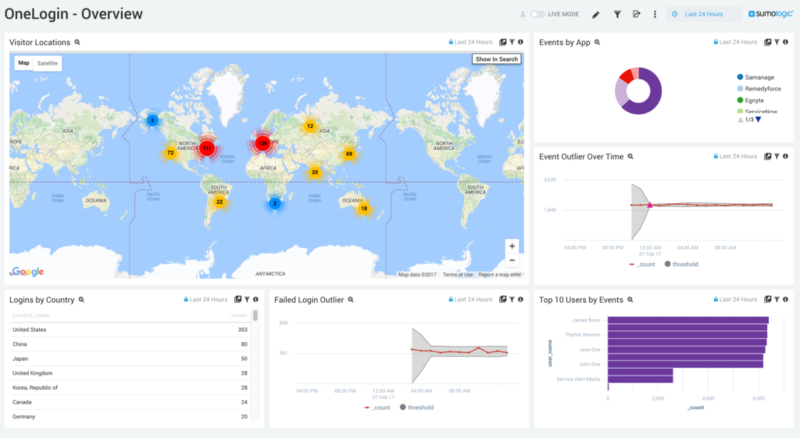 Track patterns of activity, and alerts you when users behave in ways that deviate from their normal patterns, which could suggest malicious motives. It also reveals which users are most active, which could be useful for tracking productivity in your organization. Investigate and understand user authentication patterns and additions/changes made to user accounts and passwords. This feature can be extremely useful for troubleshooting problems that arise in your IT operations. Track problems that arise in your organization back to the change that triggered them to decrease mean time to identification (MTTI), so you can quickly fix the issue and restore normal levels of productivity. With the Sumo Logic app for OneLogin, gain instant visual insights and track results over time, and integrate information with other AWS services data for complete monitoring and security. As the industry’s leading, secure cloud-based data analytics service, Sumo Logic can show you how to master your data. Our products and services take raw data and transform them into powerful insights you can literally see. Our unsurpassed visualization technology helps you make sense of traffic in your AWS environment and make smart, proactive decisions.